Four U.S. Air Force service members allegedly spray-painted satanic symbols on a historic South Carolina church, authorities said. The suspects were arrested Thursday less than a day after law enforcement officials publicized a surveillance photo of the Sept. 29 incident at the Salem Black River Presbyterian Church in Mayesville, Sumter County, sheriff’s spokesman Ken Bell said in a statement. 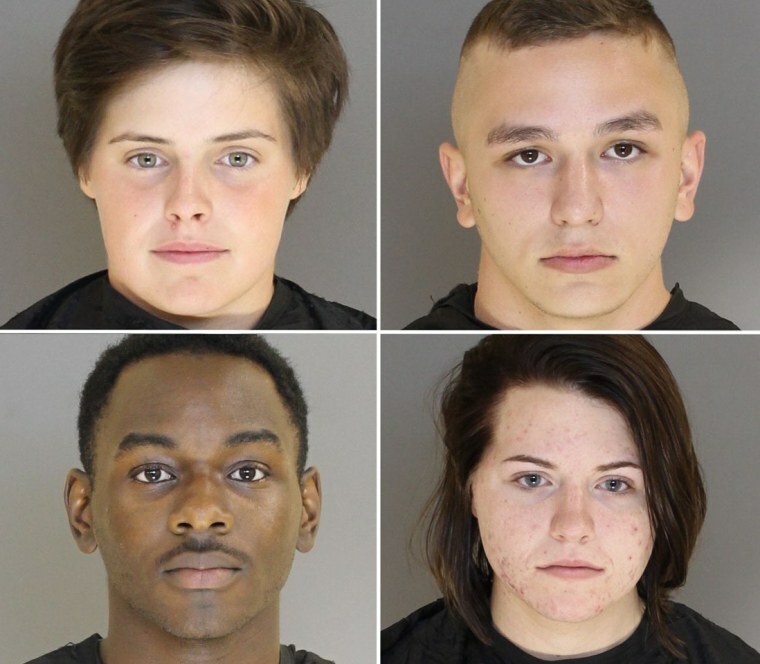 Bell said Kayla Eilerman, 18, of Ingleside, Texas; Clayre Savage, 18, of Port Barre, Louisiana; Daveion Green, 19, of Leeland, North Carolina; and Brandon Munoz, 20, of Baltimore are now charged with trespassing, criminal conspiracy and malicious injury to a house of worship. It is unclear if Eilerman, Savage, Green and Munoz have lawyers. "Several tips came in from the community, including from Shaw AFB personnel who gave us the names of possible suspects," Bell said. "We began researching the names through various databases and social media." Police began investigating after a church parishioner reported finding the door kicked in and graffiti on three buildings. The four airmen from Shaw Air Force Base, however, did not enter the church. The property damage is estimated at $3,000, NBC affiliate WIS reported. The church has been nearly unchanged since its construction in the 1840s, and has been listed in the National Register of Historic Places since 1978. It features a slave gallery supported by square paneled wooden pillars that extends along three sides. The church was previously targeted years ago for satanic rituals during this time of year in anticipation of Halloween, Sumter County Sheriff Anthony Dennis told The Sumter Item. One incident involved satanic rituals in the church’s graveyard. Convicted Charleston shooter Dylann Roof included Salem Black River Presbyterian Church on a list of a dozen churches written before he murdered nine black parishioners at the Mother Emanuel AME Church on June 17, 2015.